On 15 December 2016, Moscow City Court reduced the fine imposed on blogger and Internet entrepreneur Anton Nosik, who had been convicted of extremism, from 500,000 roubles (approximately $8,000) to 300,000 roubles (approximately $4,800), RAPSI has reported. In October 2016 Anton Nosik had been convicted of 'extremism' under Article 282 of the Russian Criminal Code for views he expressed about events in Syria in the radio programme 'Osoboe mnenie' on the radio station Ekho Moskvy. Nosik said: 'I consider that if the name of Syria disappears from the map, it won't be bad for anyone, just the opposite. In fact, a country like that should be wiped of the face of the earth, just as once Nazi Germany was destroyed and is no longer on the map.' Prosecutors had asked for Anton Nosik to be sentenced to a term of two years in prison. That day, Anton Nosik published the same sentiments in a post on LiveJournal, entitled 'To wipe Syria off the face of the earth.' A judge sitting in Presnensky district court in Moscow one year later found that Nosik's post had been intended to incite enmity and hatred of a group of individuals ('the Syrians') on the ground of ethnic origin and territorial location, which contravenes Article 282. Anton Nosik had pleaded not guilty to the charges on the grounds that the post he had distributed on the Internet contained his private opinion. 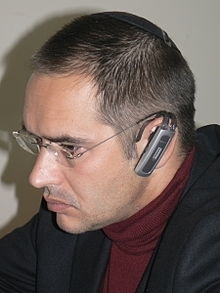 After sentencing, Anton Nosik pointed out that the fine of 500,000 roubles was the largest ever issued under Article 282.